Slowly the Western world is facing up to the real possibility that the catastrophe that was supposed to lie in wait for us, as a result of our use of fossil fuels, might have been over-egged, and that climate change may not even be accessible to human action, let alone caused by it. Germany is having trouble with its push to make alternative sources the core of its electricity production. China has stopped subsidizing solar panels. A newly elected provincial government in Ontario is set to wipe out carbon-pricing rules. The UK has seen two weeks of nil power from its offshore wind turbines. And in the USA there has been a public debate between two proponents for each side: Michael Mann of the hockey stick and David Titley, a meteorologist formerly of the US Navy, for the warmists, and Judith Curry, well known to sceptics, and Patrick Moore, former President of Greenpeace Canada, for the pragmatists, realists, sceptics, call them what you want, though not, please, ‘deniers’. Patrick Moore was one of the founders of Greenpeace, but has since declared that the organisation has been taken over by scaremongers and disinformers. The debate, at local university, was organised by a legal firm in Charleston, Virginia, and you had to pay something to attend. Judith Curry has published her own contribution to the debate, and you can read it here. It is such a sane and sensible statement that I am devoting this essay to it, but of course you should read the entire statement, which is too long for me to publish. I am writing as the debate is starting, and there will be more to say when it is finished, and we have had several accounts of it. But here is the core of her statement. She starts with what she sees as the main areas of agreement and disagreement, first agreement. Carbon dioxide and other greenhouse gases have a warming effect on the planet. How we should respond to the warming. If that is isn’t enough, she adds a cartoon, which I like. People tend to look at this or that aspect of the elephant, but not at the elephant as a whole. She makes the important point that most, a big most, of the research that bears on this issue has been focused on carbon dioxide and its role, rather than on sources of natural variability. And the result is that we really don’t know much about the causes of a change in climate.Why not? 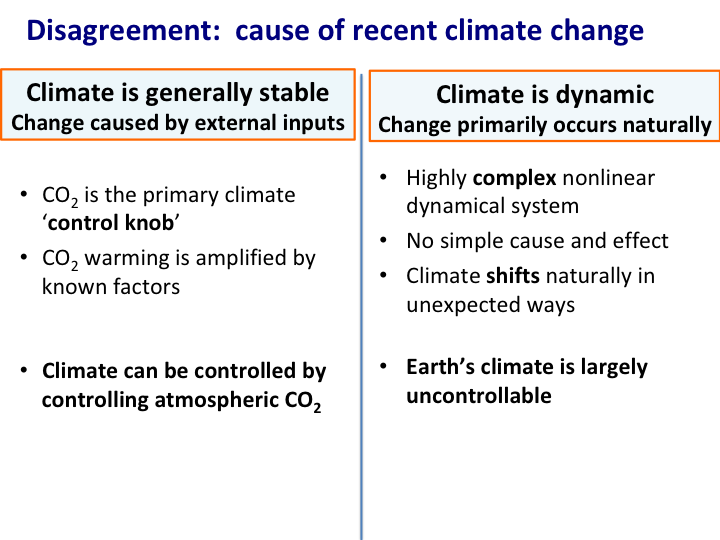 The bottom line is that we don’t yet have a unified theory of climate variability and change that integrates all this. On that evidence, carbon dioxide emissions simply can’t be responsible for sea-level rise in the last century. Then what is causing the slow rise that we see? The major part seems to be coming from melting of the Greenland ice-cap. Yet there is abundant evidence to show that the Greenland ice-cap melted in similar fashion in the 1930s, indeed, there was rather more melting then than is occurring today. That 1930s melting could not have been caused by carbon dioxide emissions, but looks as though it is related to the AMO, the Atlantic Multi-Decadal Oscillation, a long cyclic change that affects climate. Once again, we don’t know enough about it, and one reason is that it is not fashionable to study it. These are no regrets policies that do not require agreement about climate science or the risks of uncontrolled greenhouse gases. And finally, a statement on what she calls ‘the Madhouse effect’. Public attacks on other scientists that do not support the ‘consensus’. Most of what she says was my position before I ever heard of Dr Curry, but because she is a well-published and sensible scientist I have been reading her website ever since I discovered it, about 2012. It is the case, for these reasons, that I think her contribution to this debate deserves to be read far and wide. ENDNOTE One audience member has posted on WUWT to the effect that it wasn’t a real debate, but more a set of positions presented by the four speakers, and questions thereafter. I was in one such event a few years ago in Melbourne. I felt it was unsatisfactory. When figures are wafted around, it is usually in the context of ‘sea level will rise by X metres by ‘(date to be advised)’. However, whatever you may think of the BOM, it has conducted the Pacific Sea Level Monitoring Project since 1994. The data are available online, and completely fail to show any increase whatsoever, particularly for the ‘imperilled’ nations of Tuvalu and Kiribati. One could be forgiven for believing that this is real evidence against catastrophism. The BOM may manipulate climate data, as alleged by Jennifer Marohasy, but it can hardly manipulate tide gauges. So, it is irrefutable that the feared disappearance of the Pacific Island nations is simply a political stunt. They may have their problems, but they are not due to climate change. When theories conflict with facts, the latter eventually triumph. I repeat, Tuvalu has not sunk, and shows no likelihood of ever doing so. Bryan, thanks for the link to the BoM PSLM project site. Very interesting – not much SLR to see anywhere since the early 1990’s! BTW – Do you happen to know why the Country Reports are only available for years 2007 to 2010? Could it be that the initial SLR trend of 4-5 mm/yr slowed down so much that it was better not to publish them? Your summary of the ‘debate’ is rather concise and thank you. Regrettably, the dilemma facing the climate debate industry is the section of time frames for the debate. The other aspect the great reliance on the paper of one man, Arrhenius. The aspect of the debate is that it also relies on the discussion of one ‘greenhouse’ gas when there upwards of 32 contributing ‘greenhouse’ gases lurking in the atmosphere. So far the analysis industry can report on one of them i.e. CO2. The more I look at sea level changes the more I am convinced that the overriding event is that of geodynamics. 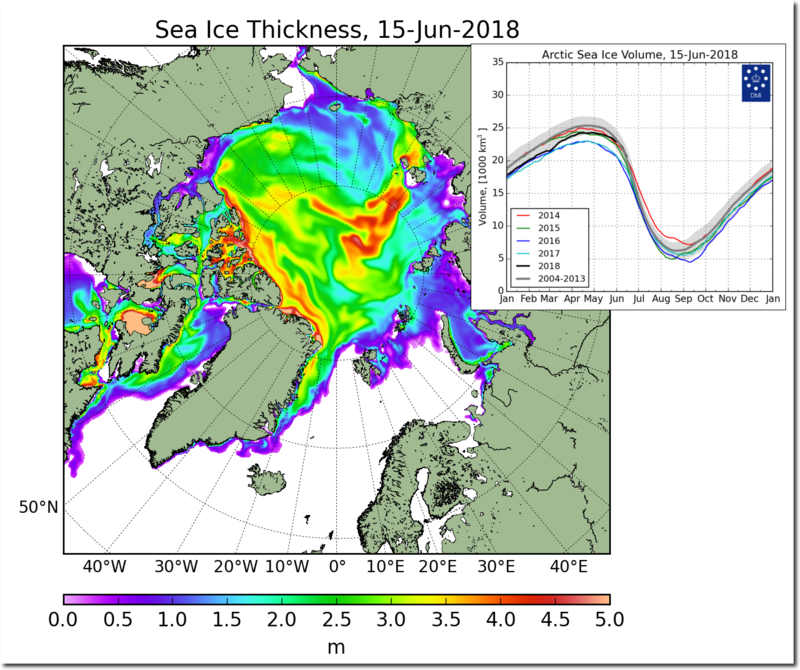 The mapped ice distributions at critical points by the USGS clearly indicate there is a huge gap in the ice mass balance calculations of onshore ice at peak periods of glaciation versus sea level fluctuations. The terminal moraines in Europe and in North America are great indicators of extent and little else in terms of ice volumes. Claims of 5 km ice sheets are sheer nonsense. Reasonable Isostatic behaviour is about 5 metres on the west coast of the UK and precious little elsewhere. 6,000 years ago Prof Fairbridge (1960) showed that the recent peak seal level was 2 metres about LWM I have sampled those fossil strandlines in Bremer Bay, WA at exactly that position above the current LWM in 1969. These elevated beach strandlines were heavily mined during the 1950’s along the Gold Coast. Actual sea levels dropped back and rose to their current levels since 6,000 years ago. The current rises in sea levels have a long way to go as evident from the work of Fairbridge. For Professor Curry to be able to identify a small amount of movement in sea levels due to the melting of ice is a huge call. The bigger picture of the emerging science of geodynamics overrules these minute considerations of the influence of ice melting on sea level. Finally one of the most under reported discoveries is the that of the dating at 2.1 million years of blue ice at Allan Hills in Antarctica. At about 1,800 metres elevation it is a huge result that indicates that the overall climate has been stable in Antarctica since that time and that there is a 1 million year time gap between this ice and the ice being intercepted in Dome C and Vostok drill cores. Absolutely fascinating stuff. 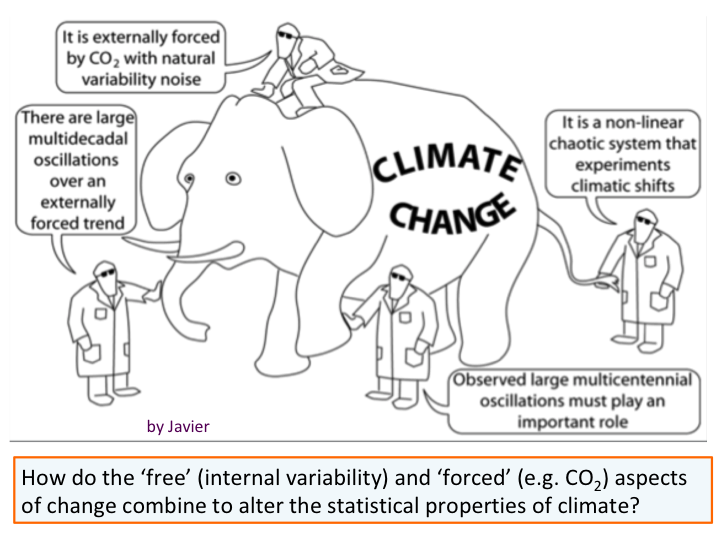 The real elephant in the room is the fact that we can’t mitigate their so called CAGW. The non OECD countries will be building many hundreds of CF stations for decades into the future and of course S&W are delusional at best. This means that co2 emissions will soar into the future, even though OECD countries have mostly refused to build more Coal Stns even though costs have sharply risen for decades. If I had known earlier, I would have made reference to an open letter to the President of the Geological Society of London by 33 of its present and former Fellows, and another list of supporters, asking for an open debate about the Society’s public statement on climate change. It’s a bit overlong, and needed a strong editor, but like Judith Curry’s opening statement above, it is sane and sensible. I hope there are more of these to come. The other day a worriedly intoning presenter on SBS news told us that 3 trillion tonnes of ice had been melted from Antarctica. Her tone was of doom coming. I said ‘Rubbish!’ and other parliamentary phrases as this went on, and then thought I had better do some homework. Three trillion tons is about 0.011 per cent of the ice sheet. The rubbish rejoinder came from the notion that the ice in the present Antarctic is capable of melting. The correct explanations, if any are really needed, are that two likely sources for any reduction (and there is no real evidence of any reduction, it is all estimates and re-analysis of existing data) are magma vents under the Antarctic Peninsula (there seem to be about 150 of them) and ablation (evaporation) from wind. The Antarctic ice sheet is frozen solid and can’t ‘melt’ until somewhere the temperature gets to around 1 degree C.
What was the date of the SBS news report using the word “doom”? I have not heard any public-funded news reader using such language. Chris, your eagle eye picked up an error, which I have corrected, but probably not to your satisfaction. Any other comments on the ‘melting ‘ of Antarctic ice? You mean the latest COMPUTER MODELLED information, don’t you, blith? Don is correct, even the RSS TLT shows little SP warming since 1979 or about 0.03 c decade. And no change from UAH V 6 SP TLT over the last 39 years. It seems that their co2 has magical qualities, able to warm the NP regions, but not the SP. But earlier 20th warming did the same, well before 1950. Of course much more likely to be the NATURAL warm phase of the AMO. You are the chief cherry picker. Global warming is not represented by the south pole. The north pole and every other part of the globe are exact opposites in that they all are warming at rates almost 5 times the value you have cherry picked. You should have noted that global warming over this period is approaching 2C per century. You should have noted that NH warming over this period is over 2.4C per century. You should have noted that SH warming over this period is approaching 1.5C per century. You should have noted that Tropics warming over this period is around 1.5C. You should have noted that NP warming is almost 5C per century. Chris, UAH V6 shows 0.13 c per decade of warming since 1979 or about the same as RSS V3. The RSS tool also shows that there has been little ( RSS V 4) warming trend since 2015. Check out the latest trend data using their tool. If souls such as Patrick Moore and others are going to tag others as “alarmists”, “scaremongers”, “disinformers” and etc than they have self-identified themselves as “denialists”. Denialists they are, denialists they remain. It is no use complaining if people get paid back in their own coin. No they haven’t at all. They have identified themselves as people who use names about other people. To deny something is religious in tone. Denying the Ascension, for example, or the divinity of Christ. Patrick Moore described his opponent in unflattering terms. That has nothing to do with the science. And science is not religion, except for believers in human-induced climate change. Using derogatory names about people WITH THE INTENTION of opposing their views is an artefact of denialism. Moore has unleashed a religious chant against those who reject his crusade. His slander is not science and is pretty much the same spite we get from many religions against heretics, blasphemers and etc. Science is not religion, but denialism is. Science is not religion, but climate science is. Have you checked your local king tide levels yet, blith? Do get back to us when you have. You show me yours and I’ll show you mine, blith. Meanwhile, I suggest you go outside and check current sea levels. Chris, there is so much assertion in your post! A more reasonable person might ask you how you know what people’s intentions are, given that you were 10,000 km away from the event. Have you talked seriously and at length to Patrick Moore at any time? They might point out that the environmental movement is itself a quasi-religious one, so that the ‘religious chant’ might properly be applied to what Greenpeace, Sierra and other environmental organisations put out. Moore, being one of the early adherents of Greenpeace, and celebrated for that at the time, is after all in some position to say what has happened to that organisation. Are you? On what basis? Denialism is a word that you use a lot, and I doubt that many readers know what you mean by it. But that ‘denialism is religion’ is pretty far-fetched. Most of those who comment as sceptics point to evidence and data that supports their views. You mightn’t like their arguments, evidence or data, but calling them ‘denialists’ doesn’t work at all. You need not only to point to some data of your own, but show why yours is to be preferred (and not by appeals to authority). If I say that your contributions on these subjects suggest to me that you are a full-bottle believer in the catastrophic view of climate change, does that make me a ‘denialist’? If so, why? We only do this on your behalf to stop you from further embarrassing yourself. It is also an artefact of the AGW campaigners approach to sceptics, witnes your use of the derogatory term “denialism”. Be very, very clear. I do not introduce terms such as “denialism” until AFTER a particular individual has earned this appellation themselves. There is such a thing as “denialism” usually in other fields and waved by the likes of David Irving and Keith Windschuttle, those parading “intelligent design” and denying the moon landing. If you want to contest global warming science then you need new science at the same level, not the slander and defamation coming out of Curry and others. Nearly all alarmists WRT “climate change” [such as yourself, blith] use the “denialist” term indiscriminately because it suits you to denigrate rather than debate. The fact that you “deny” that sceptical scientists are much more inclined to make decisions from observations rather than computer programs leaves you wide open to honest criticism. The term is very inappropriate but certainly applies more to alarmists than scepticts. You demanded that I “provide any evidence where (you) have rejected data?”, and accused me of telling untruths, an assertion you repeated when, to molify you, I changed reject to ignore. Please clarify how you decide that data have been “cherrypicked”, noting that you “reject” data you consider to be such. Thank you, however, for acknowledging that you do “reject” some data, confirming the opinion I expressed earlier. Everyone should reject “cherrypicked” data. So what is your problem? Rejecting or ignoring “cherrypicked” data is NOT rejecting or ignoring data itself. I am very clear that your false accusation DID NOT refer to “cherrypicked” data. Please – no more crazy diversions. You should simply retract your false statement. I am certainly happy to reject “cherry picked data. You have not yet explained how you, specifically, identify it. You made no reference to cherry picking in your original statement. You are changing your position as you go. My issue was with YOUR falsification. My issue was with YOUR false statement (version 1 and version 2). You could have retracted them some time ago. Did you intend to accuse me of ignoring or rejecting ONLY cherrypicking data? If so, why not draft a third version? You can include the word “cherrypicking” if you like. And do they earn this appellation simply by disagrreing with you? Certainly seems so, as many of those you abuse as “deniers” provided data, albeit data that you reject. Claims such as yours that I reject data are slanderous tools of denialists. Please provide any evidence where I have rejected data? This is purely your imagination. Among others, spangled drongo regularly providrs links to a wide range of data. Your responses give no indication that you read those links. Personal abuse is not a valid argument, try again. So you made a deliberate falsification? You claimed I reject data. You need to retract your false statement. Change “reject” to “ignore”, for what practical difference it might make. Reject suggests that you consider the closerehile ignore seems closer to your apparent position. So you want to repeat your accusation in new words. But your claim that ignore data is just as false. I ignore no credible data but certainly reject the cherry picking of data that underlies so much of the denialist project. Poor silly ol’blith. Not only conveniently ignores data and the real world [sea levels are just one instance] but then resorts to denial as defence. Read your post of 1036 on 16 June, to which I responded. It does not mention “cherry picked”. I expressed an opinion on that statement, not a statement of fact about how you decide what data you will or will not accept. Your false accusations had nothing to do with “cherry pick” and nothing to do with an opinion on “cherry pick”. So do you maintain or retract these statements? Please enlighten us all on what fundamental data you refuse to reject and ignore, blith. For example, the IPCC 2001 WG1 Report said that the measured global temperature increase of 0.6°C ±0.2° in approximately 120 years was not natural. IOW, in excess of natural climate variability following the little ice age. Do you accept or reject/ignore that? BJ, being the hypocrite he is, I don’t blame you for ending your “conversation” with our blith. I think it’s best to forget about Chris because he’s not worth the trouble. Left wing people couldn’t care less about data, because ( in this case) they are the urgers that think everyone should agree with their CAGW mad cult . But does anyone remember me linking to the Royal Society ALL MODELS graph on Greenland and Antarctic SLR attribution? All the models were displayed showing Greenland positive and Antarctica negative for the next 300 years. So I suppose if you now believe this latest study you must throw all those previous models out the window? And then you must surely doubt all their other modelling studies on temp etc as well? Surely if all the negative SLR Antarctic models can be changed overnight then anything is possible? BTW three cheers for Zwally et al throwing a spanner in the works. You’re right as usual, Neville, but I am used to talking to brick walls as I hang out with many green types. And “green” sums them up well. Back in 2008 James Hansen claimed that sea ice in the Arctic would be gone in summer in 5-10 years. Thanks for another interesting article, Don. Unfortunately, looking at the comments, readers are as divided as ever on this subject, and do not appear to be able to make a rational argument against the skeptical side, generally resorting instead to ad-hom, authority and cherry-picking. I personally find this ‘trench warfare’ approach by the ‘true believers’ quite tiresome, but I am always impressed by your erudite and tireless efforts to enlighten and educate your readers. In my retirement I prefer arguing with sticks of timber about how they should behave as I turn them into furniture! PS – I noted your comment about ‘3 trillion tons of ice lost’ from the antarctic. I have noticed that this is a very common propaganda technique used by the pro-CAGW crowd to scare the masses, who often have no idea about the sheer immensity of the antarctic ice sheet, and that the air temperature above it is many tens of degrees below zero all year round ensuring that it will stay frozen for millennia unless some extra-terrestrial event supervenes. Things got too warm for the warmists with their busybody stupidity. Their desire to use large blocks of “social housing” for large scale carbon reduction measures through govt-enforced insulation led to the disastrous Grenfell Tower debacle. An example of good data. Not because of the actual numbers but the trend. The trend is the key. It seems we are experiencing massive ice-melt similar to previous inter glacial eras, when the natural causes that then applied, do not exist. This does not bode well for the future if GHG levels exceed levels during previous natural ice-melt episodes. Don, I make no comment as to whether these ice masses are likely to disappear, but your position is not even internally consistent. and in the next sentence…..
Don that is pretty silly. Cold places have summer too. Every summer it easily gets to 10C to 15C in the coastal regions of these ice masses. That’s got nothing to do with climate change, that’s summer and has been going on for centuries. Next time you find yourself in Seward AK, go for a day trip to Holgate Glacier and you’ll see massive chunks of ice calving away every day of every summer. That’s been happening since long before the industrial revolution. These ice masses go through annual cycles of accumulation (snow) and ablation (melt). Those who worry about these things believe the ablation phase of the cycle exceeds the accumulation phase, and will continue to for the foreseeable future. To my untrained eye, that seems at least possible. Compare that to your musings on the topic. It’s as if you think the alarmists believe we’ll all be able to gather around one weekend in summer and watch it melt away, much like you could an iceblock on the back deck. You rightly point out that’s not going to happen so conclude there’s no issue. Think decades, maybe even centuries, of continued deficits and you’ll see the problem. Oh dear, you try so hard don’t you, Jimbo? Ablation is surface loss, of glaciers or rocks. Melting is a form of ablation, but not all ablation is melting, which is the liquefaction of something through heat. The ice masses in Antarctica lose through wind, as I said, not through heat (unless it is heat from below). Yes, temperatures as high as 15C have been recorded on the coast of the Antarctic Peninsula, but the ordinary summer temperature is below 0c most of summer. Look it up, Jimbo. Wikipedia has a sensible essay on Antarctic climate. And while you’re reading it, note how small the AP is compared with the rest of the continent. Not much sea-level increase from there. And a new article by Zwally, which I haven’t yet seen, is apparently going to say that the ice accumulation in East Antarctica offsets by a considerable amount any loss from WAIS or the AP. What have you read with your ‘untrained eye’? Why do you think wind melts ice? What difference does it make whether the ice turns to water or vapour? Either way it’s left the ice mass. Why do you think the coastal areas are warmer than the inland? What do you will happen to the inland temperatures if the ice retreats towards it? Nobody is suggesting we’ll be able to gather around down there on a particular date and watch the whole lot melt at once. It’s all about the ablation / accumulation balance. Your claim that it “can’t melt” is demonstrably wrong. Bits of it melt every summer. Oh dear, you must have been a joy to teach.The conventional AGW/Climate change scenario has CO2 raising air temperatures, melting ice and raising sea levels. But the icy winds in the Antarctic do not ‘melt’ ice. They ablate it. Wind of this kind does not melt ice, by definition (melting is liquefaction through heat). So, there’s no melting in the Antarctic except occasionally on the AP and in parts of the WAIP, but the air temperature there is usually below zero. Give it up, Jimbo. Think about it some more before you write again. The measured ice loss, if those measurements are at all correct (they are estimates) is infinitesimal. What are you trying to prove? Why? Don, conventional theory has the increased heat (energy) in the system – due to the energy imbalance caused by increase CO2 levels – melting ice. It’s because of the amount of energy spent melting the ice that the temperature doesn’t go up as much as it otherwise would. You need to do a lot more homework on this. This is pretty basic physics. And whether the ice melts into water or is turned directly into vapour makes no difference. It’s left the ice mass and and is now in the water cycle…. where it’ll turn to rain or snow. The only measure that matters is the ablation Vs accumulation balance. I think you might be violating some pretty fundamental laws of thermodynamics there. You’re changing the state of ice without heat? Every time we get into this discussion, you consistently confuse heat (energy) with temperature. One is measured in Joules (or calories) the other in C (or F). It’s precisely because it takes heat to melt ice that iceboxes are so effective. When heat is introduced to your icebox it goes to melting the ice rather than raising the temperature of your beer. But of course as you both seem to be of the evidence-reject/ignore persuasion you probably prefer to carry on with your denial. The East Antarctic Ice Sheet (EAIS) is the largest potential contributor to sea-level rise. However, efforts to predict the future evolution of the EAIS are hindered by uncertainty in how it responded to past warm periods, for example, during the Pliocene epoch (5.3 to 2.6 million years ago), when atmospheric carbon dioxide concentrations were last higher than 400 parts per million. Geological evidence indicates that some marine-based portions of the EAIS and the West Antarctic Ice Sheet retreated during parts of the Pliocene1,2, but it remains unclear whether ice grounded above sea level also experienced retreat. This uncertainty persists because global sea-level estimates for the Pliocene have large uncertainties and cannot be used to rule out substantial terrestrial ice loss3, and also because direct geological evidence bearing on past ice retreat on land is lacking. Here we show that land-based sectors of the EAIS that drain into the Ross Sea have been stable throughout the past eight million years. We base this conclusion on the extremely low concentrations of cosmogenic 10Be and 26Al isotopes found in quartz sand extracted from a land-proximal marine sediment core. This sediment had been eroded from the continent, and its low levels of cosmogenic nuclides indicate that it experienced only minimal exposure to cosmic radiation, suggesting that the sediment source regions were covered in ice. These findings indicate that atmospheric warming during the past eight million years was insufficient to cause widespread or long-lasting meltback of the EAIS margin onto land. We suggest that variations in Antarctic ice volume in response to the range of global temperatures experienced over this period—up to 2–3 degrees Celsius above preindustrial temperatures4, corresponding to future scenarios involving carbon dioxide concentrations of between 400 and 500 parts per million—were instead driven mostly by the retreat of marine ice margins, in agreement with the latest models. Ice loss is not infinitesimal. Don, your obsession with whether or not the outside air temperature is above or below zero has me wondering if you think conduction is the only way of transferring heat to ice? Radiation can deliver heat to ice regardless of the surrounding air temperature. I genuinely believe you’d benefit from a refresher course on heat transfer, radiation, convection and conduction. They might seem icy to you if you’re out standing in them, but clearly if they’re evaporating (or melting) ice they’re not icy enough. What is puzzling to me is why you think any of this helps your cause? The theory is that increased CO2 levels cause an energy imbalance which results in more heat in the system which results in more ablation of glaciers. Everything you’ve contributed here confirms that. It was only ever your small-mindedness that required the whole of Antarctica to be regularly sitting at 2C before ice would melt. A high school geography student has a better grasp on the cycles involved then you’re demonstrating. And why are you so hung up on whether the ice melts or evaporates? It’s all ablation, it all makes the glacier smaller, and it’s all caused by heat. Whether the heat is delivered by winds in the depth of winter, or by radiation on a sunny day, or by conduction on a balmy summer’s day it’s all heat. The laws of physics tell us the only way to change the state of ice is to apply heat. You’ve somehow got it stuck in your head that the only way global warming can do that is via conduction on a balmy summer’s day. That’s your straw man, nobody else’s. Chris and Jimbo, discussing matters with you two is like wrestling with jelly. You shift, duck, weave, ooze away and never get to grips with anything. For the record, (i) ablation in the Antarctic is from dry cold winds. If it is caused by energy balance please tell everyone how this is done, since it is totally unclear to me, and to the literature, to the best of my reading. I do know about foehn winds, since Canberra’s weather is affected by them. (ii) There is no evidence that these Antarctic winds are warm. None at all. They are probably as cold as the ice around them. (iii) ‘it’s all affected by heat’. Show us how. Statements like that one and the other about ‘energy balance’ are just hand-waves unless you can show what the mechanisms are. (iv) The alleged three trillion tons of ice lost since 1992 is based on all sorts of models, satellite runs and is of course an estimate. That it was widely reported does not make it correct. Three trillion tons represents 0.1 per cent of the Western Antarctic Ice Sheet, which is 11 per cent of Antarctica, and 0.011 per cent of Antarctica. There are other estimates which say that the addition to Antarctica is greater than the supposed ice losses. In short, there is disagreement, and nobody knows. I regard a loss of 0.011 per cent of ice, even if it were real, as infinitesimal. (v) You seem to assume that any trend you can see will continue indefinitely. I don’t. (vi) My position on global warming is the null hypothesis: carbon dioxide does not have a significant effect on climate or global warming. On the evidence available, the increase in carbon dioxide levels has been good for the planet and living things in it. There is no evidence at all that there have been harmful effects. If you think there have been, you need to show what they are. What might happen in a thousand years or more does not worry me. One man’s handwaving is another man’s physics I guess. Where do you propose the energy required to evaporate the ice comes from? Claiming “it just ablates” is handwaving. Jimbo, read my piece above once more. My position is that of the null hypothesis. I am not making claims about the effects of warming. I simply point out what seem to be the flaws in what is put forward by who think otherwise. If you think heat does the job, then show us the mechanism. You’re the one with the firm belief. The only belief I have here is in the laws of physics. It takes heat energy to convert ice to water, and even more heat energy to convert it to vapour. Your null hypothesis appears to be that the ice converts to vapour without the need for heat energy. That’s a big call! Jimbo, I have no idea what you know about physics. You certainly don’t seem to know what a null hypothesis is, though I set it out above. It doesn’t require anything from me, only from you, if you want to keep going with your charade. Those inserting vague words such as “alleged” in front of rigorous scientific facts are the ones truly displaying such tendencies. “There are other estimates which say that the addition to Antarctica is greater than the supposed ice losses”, without any evidence whatsoever are the ones who are shifting, ducking, weaving, oozing away and never getting to grips with anything. Do you have any evidence that Zwally did not make the same level of “estimates” as you think jeopardises others you disagree with. Only those who shift, duck, weave, and ooze away, invent such disparaging devices. Claims that Antarctica is gaining ice have not survived cross examination by scientists. Chris, you are, how do I put it nicely, mistaken. The notion that the Antarctic has lost 3t tons of ice is not a ‘rigorous scientific fact’. It is an estimate, at odds with other estimates by other scientists. Don’t you understand that? ‘Claims that Antarctica is gaining ice have not survived cross examination by scientists’. Really, which ones? Where? Why are they right? How are you in a position to say so? Don’t you understand that the debates are between scientists? is unbelievable. Almost all “rigorous, scientific facts” from measurements are estimates and when levels of confidence and errors are quantified then this produces “rigorous scientific facts”. You were told that the issue of “other estimates” were covered by the paper I linked to. I even quoted the section so you would not miss, or duck it, or weave your way from considering it. So if you have other estimates supposedly “at odds” then produce them. Vague handwaving does not assist you. This is the second time I have posted this. Unless superior scientific data emerges or trends change – it is clear that Antarctica is loosing ice. According to the then Director of the Antarctic Division of the Department of External Affairs in 1959, Australian scientists have known about Antarctica ice sheet losses since the 1950’s and also recognised that this was “very much slower than that exhibited by glaciers in the Northern Hemisphere”. In 1959 there was little doubt that Antarctica was “warming up” with one study showing a temperature rise of 2.6 F over a period of 45 years [presumably from 1914?]. So scientists seem to have been aware of Antarctic warming since the First World War. When you add the known facts that the calculation of mass balance is flawed by known reference frame error, there is so much personal estimation based on philosophy rather than science and Antarctic temperatures haven’t warmed at all [temperatures there were over 5c cooler than seasonal norms during the latest el Nino] it is all non-science. Chris, we are apparently using different versions of the English language. The people you refer to have made what I understand to be an estimate. Or, if you like, they are using an estimate to support a hypothesis. They disagree with Zwally. He disagrees with them. They are all scientists. The ones you prefer have not, in any way, established a ‘rigorous scientific fact’. But if you believe they have, well, there’s nothing more to be said, is there. I suppose it boils down to science (based on experiments and data) vs debate (based on opinions and beliefs). You will find that even the Australian Bureau of Statistics uses ‘estimates’ but it is a rigorous scientific fact that our population is increasing by around 1.6% per year. If you can accept this then the same applies to other data sets including meteorological data. At least we now have real science on climate change. It doesn’t boil down to science. Scientists are disagreeing. They are all using estimates of various kinds. As far as I can see, none of them is exactly right. They certainly can’t all be right. And, with reference to ducking, weaving and the rest, you have just provided a good example. I point out that the paper you are relying on is based on estimates, and what follows therefore can’t be a rigorous scientific fact. You duck and weave to say something quite new, that the ABS (hitherto not mentioned) uses estimates about population size (actually, and technically, it is an enumeration on which population increases are based), ‘but it is a rigorous scientific fact that our population is increasing by around 1.6% per year’. Well, no. It is another estimate, not a scientific fact. And if it were rigorous, you wouldn’t need to qualify it by saying ‘around’. You would simply give the increase. It can only be an estimate until there is another enumeration (census). Chris, you believe that the scientists you prefer are the right ones, and that there are no others. Those who disagree with your preferred scientists are just voicing their ‘opinions and beliefs’, even if they are practising scientists. I don’t know why you come to this view of things, but it seems to me to be profoundly wrong. “If you can accept this then the same applies to other data sets including meteorological data. The easiest person to fool is yourself, blith. OK if you disagree with the ABS estimation of the growth of Australia’s population being 1.6%, then you can definitely disagree with the fact that the trend in Antarctic ice is negative. This is an unsound disagreement. You also will not be able to observe any fact in social science, nor will you be able to measure quantities in any kitchen recipe. If estimates were not producing facts, there would be no way NASA could land on the moon because the distance was just an estimate. Estimates controlled for systematic and random areas are the best facts we can obtain. And such estimates how a clear trend for Antarctic to loose ice in accordance with global warming. Apparently this fact was reported in data from an American Antarctic base since the First World War. If there are other, refereed, estimates of Antarctic ice increase (not just East Antarctica) I would like to see them. 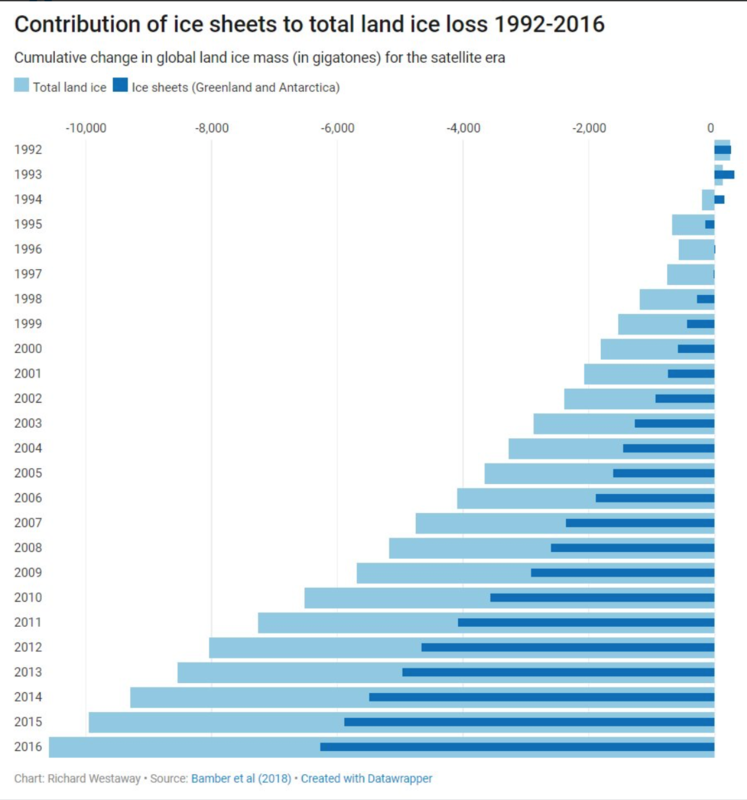 The ice loss now since the 1990’s is 10,000 gigatonnes or 10 trillion tonnes [Global]. Or, 3 trillion tonnes [Antarctica]. But the sea levels have yet to rise, hey blith? I don’t think it is possible to explain things to you. But here is my last attempt. 1. The scientists whose work you like have estimated the amount of ice loss for the Antarctic. 2. This is a fact. They have done so is a fact, because they have published their findings. 3. Their findings, however, do not amount to a ‘scientifically rigorous’ fact’. There have been many other attempts. These attempts do not arrive at the same amount. No estimate is a factual account of ice loss, because it is an estimate. The real loss (or gain), if it could be measured accurately, would be a precise figure, about the amount of loss (or gain) from time t to time t1, measured to the nearest kilogram, say. That figure would be a rigorous and scientific fact. 4. We do not have instruments capable of providing such an accurate figure. 5. You are at liberty to argue that the estimate is the best figure we have available (as with the rise in the Australian population) but that would require you to analyse all the other estimates and show why the one you prefer ought to be accepted above all the others. They are not all the same, and it is highly likely that they are all wrong. The more precise they are the higher the likelihood that they are wrong. 6. There are other problems with the way you approach this domain, but I’ll stick just to the notion that an estimate of quantity X is a ‘scientifically rigorous fact’. Don, that sentence is inconsistent with the laws of physics. Please try harder if you want to make a useful contribution here. The accuracy of the melting figure is within a range – and yes we can estimate at this level of confidence. Surely if you look at the graphics you will see a decline in Antarctic ice? What is the references for these attempts? And are the amounts they arrive at “estimates”? The main point is that Antarctic ice mass is falling. Geezzz you’ve got a lot of patience Don. Here’s the latest PR study from De Santis et al, showing an increasing sea ice trend in the SH since 1979 and the later trend seems to be an increasing one. Of course all the modelling shows an increasing Antarctic trend for another 300 years. And Antarctica holds 89% of the planet’s ice sheet and Greenland about 10%. Co2 Science have also added many more recent PR studies at this link. Sea ice is not the topic. Once again here all the PR models from the Royal Society for Ant and G/land until 2300. Ant is negative for SLR (89%) and G/land ( 10%) is positive. You do not understand your own references. This is a “rate”. There is no author or useful source. The rate of any growth can go “up” and “down” but still growth proceeds in the “same” direction. Remember the panic in the MSM about the warming on the Ant peninsula? Now Turner et al ( 2017) have suddenly discovered that the same Ant pen has been cooling since the late 1990s. So no warming for the 21st century. Gee, Neville, but it says: “Absence of 21st century warming on Antarctic Peninsula consistent with natural variability” and we all know how our blith is in absolute denial of climate natural variability. Even when the IPCC 2001 WG1 group said that the measured global temperature increase of 0.6°C ±0.2° in approximately 120 years was all due to natural climate variability, a dyed-in-the-wool alarmist changed it to read that it was not natural. Based on personal conviction, of course. For alarmists “climate change” never includes Nat Var. The real world must never be allowed to interfere with their emotions. SD you took the words right out of my mouth, but here’s another problem for the extremists. Who can forget Turney and the clueless “Ship of Fools” fiasco? This was in Dec/ Jan of 2013/14 and was very accurately covered by Steve McIntyre at his Climate Audit blog. Of course at the same place in Jan 1912 Douglas Mawson landed ( Commonwealth Bay) in almost ice free conditions. Yet silly Turney was trapped by ice and had to be rescued by specialist ships and equipment over a century later. Notice the large expanse of open water (including ship) in the bay in 1912 and penguins standing on the bare rocks as Mawson walks to the right of the video. Your so-called “almost ice-free conditions” was a denialist trick as the video shows miles of ice cliffs with some rocky outcrops. Further Commonwealth Bay is not even within the Antarctic circle. It is therefore cherry-picking to inject it as if it was somehow relevant. We know Antarctica is melting. The Australian Antarctica Division (Department of External Affairs) has known about this since the 1950’s. In January 2001, it looks like all the 1912 ice cliffs have disappeared and the Commonwealth Bay shoreline is mostly rock. Good facts dowse denialist flames. Have they, blith? Can you supply details of that “knowledge”? And do you think adding ice that is kilometres thick, from as deep as 2.5 k below sea level to up to 4.5 k above might possibly limit their knowledge somewhat? The land movement they are using to model possible melting could be all due to mantle movement caused by volcanic activity which is known to be occurring there. Accurate knowledge of this part of the world is purely aspirational. Chris here are more problems to think about. The RSS tool shows just 0.03 c ( TLT) a decade for SP since 1979 and UAH shows no warming at all. By 2100 that would be just 0.24 c warmer than today , providing that we can accept the RSS data. It would probably mean more ice if that were the case. Who knows? But UAH V 6 now shows no warming for nearly 40 years, so I wouldn’t get too excited. BTW Steve McIntyre has prevailed and has forced PAGES 2K to accept his auditing of their data in 2013. There has been nothing unusual about the earth’s temp over the last couple of thousand years if you accept their latest study. Certainly Antarctica has been warmer in the past and for a long time and recently during the 30 year temp spike from 1671 to 1700. I picked that up at the time. Good to see that Steve was thanked by the Authors for finding their mistakes. But how do you use some data upside down, because I thought that was “upside down Mann’s” specialty? Fair dinkum if Steve didn’t exist we’d have to invent him. Our blith’s response to real world science is an alarmist article by super-alarmist Chris Mooney in the alarmist WaPo. Where we are now w.r.t. Antarctica melting. A typical up-to-date newspaper comment. 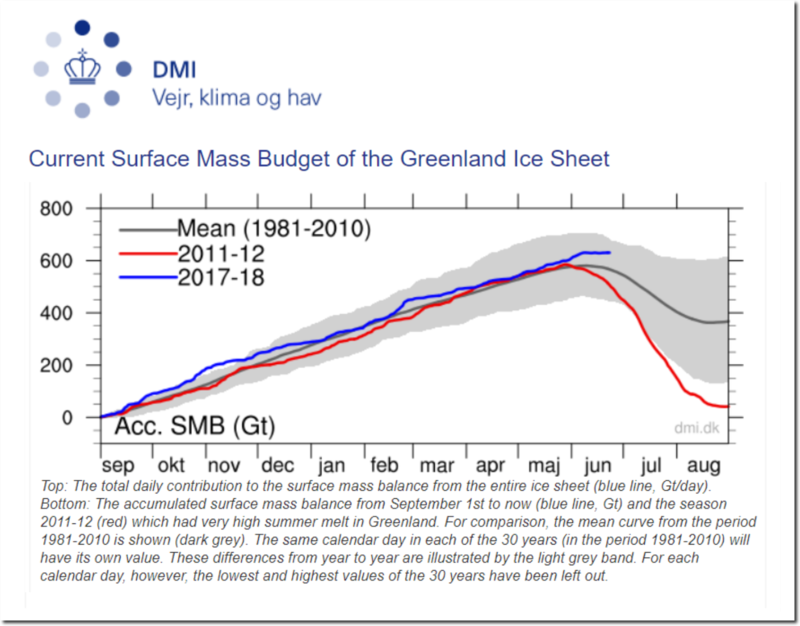 Check the current surface mass budget of the Greenland Ice Sheet, blith. Here is some more detail on your “Antarctica is melting in the dark,” blith. Here are many recent SL studies that show much higher SLs from around the world during the earlier Holocene. A number of these studies cover Australia and Antarctica and today we seem to be at a low point compared to these studies. I’ve referred to the Calvo et al study before that shows a reduction in southern OZ and Antarctic temps over the last 6,500 years. This reduction in temp has led to a reduced rainfall pattern over Southern and SE OZ until the present day. This link shows that Antarctic and OZ SST + inland temps ( White et al) show a similar 6,500 year pattern of cooling. Here’s the conclusions of the Calvo et al study and there a number of graphs at the link below. Here’s Prof De Deckker ABC Catalyst program “1,000 Year Drought” looking at the last 5,000 years of Sth OZ rainfall. You can pause the video at about 8 mins 20 secs to check out the graph. He is the third author listed for Calvo et al study. BTW the ABC Catalyst “Narrabeen Man” story mentions that SLs were 1.5 metres HIGHER on the OZ east coast just 4,000 years ago, so we’ve had some cooling since then. Check out the video at about 1 min 20 secs or read the transcript. Also a very interesting story about swift justice in Nth Sydney 4,000 years ago. Your bias is showing. I note that your quals are in political science and not the physical sciences and certainly not in atmospheric physics and climate change etc. However I will give you some credit for perhaps picking up some acumen with the scientific method when serving as chair of the ARC. However your recent comments and this paper disclose a less than thorough checking of sources at the very least. For example you give great credit to Patrick Moore as a founder of Greenpeace. I suggest you recheck that one and his bona fides in this space. He is more frequently cast as a hired gun for the anti movement and fossil fuel interests. Also you (or your fellow travellers on this blog) jump to papers asserting SSL’s that show higher sea levels in the past etc without reference to post-glacial rebound effects in that time scale. There are many similar holes in the arguments put forward here. In short your science is somewhat lacking. Similarly your rapid (might I say rabid) defence of Peter Ridd shows similar style. I suggest you check some of the background facts. Ridd for over a decade has run a counter AGW line in print and on TV without any push back from his employer. It is only his fairly recent open attacks on fellow researchers in the press rather than through scientific debate in published papers that he has fallen foul. The people he has attacked have published proper rebuttals to his claims several times but I see no coverage of that here. Finally there is one very unscientific forecast which can be made with reasonable certainty. Those (the vast majority of current climate science researchers) who predict dire outcomes and the need for action if proved wrong by history will be merely laughed about. On the other hand those who like you advocate that there is no problem and we should continue with business as usual, if proved wrong (I venture to say the most likely scenario) will be condemned and vilified. I know which side I would rather have my descendants see me on. You sound a lot like our blith, stu. But enuresis, while it may contribute to a little SLR, is not evidence. Maybe you should drop your preoccupation with urine or at least explain it. Meantime how about actually responding to the points I raised. And BTW are you also an adherent to the heliocentric theory? Enuresis is about more than urine, stu. But my preoccupation is with evidence to support your POV. You were a little light on. I should have stated, but assumed you understood, EVIDENCE [not the precautionary principle] is what we are on about. The PP is the foolishness of paying twice the price of your house every year for insurance against a remote possibility. In late May 2017, the western town of Turbat in Pakistan hit 128.3 degrees (53.5 Celsius), tying the all-time highest temperature in that country and the world-record temperature for May. And the northern summer has just begun. Yes, such heat records – when there is no El Nino and when we would otherwise be trending into a cooler era – are indicative of artificially increased warmth in the Earth’s system. However it would be useful to know the sources of such information. Yes I should have shown the immediate source as the Washington Post. But what is even more interesting is the fact that JQ, yourself and all your warmist mates are happy to criticise Don, M R, sceptics et al but are in absolute denial of the fact that you don’t have any evidence to support your own position. At least we are rationally sceptical. You warmists seem to relish enuresis. Sorry, stu, that’s not evidence. Cherry-picking hot spots can be negated by cherry-picking cold spots of which many exist and in these days of more thermometers and 1,000%+ increases in population, the cold spots carry a lot more weight. What is evidence is anything that can refute the fact that – as mentioned by a working group of the IPCC recently – the earth’s measured warming of 0.6c +/- 0.2c in the last 120 years is anything more than natural climate variability. There is a possibility of course that some of that small amount of warming is due to humans’ CO2 emissions but it would only be tiny seeing as Nat Var can quite easily account for twice this amount of warming. Particularly after emerging from the coldest extended period in the history of civilisation. The heat producing theory of ACO2 is still just that. A theory based on assumption, not evidence, and while this current slight warming correlates with our ACO2 emissions that is not evidence. Now stu, do you possess any such evidence? Or do you just embrace GCM cli-sci? And even if you had any of this evidence that no-one has yet been able to produce, how could a small percentage of this small warming be anything other than an advantage for our resource-challenged world? You could also perhaps explain how your precautionary principle of sending ourselves broke in order to fail to solve a non-problem works to our advantage? Yes you could say “cherry picked” but taken over a longer period there has been a definite trend upwards. And of course it has occurred at a time of apparently reduced solar activity so we should have expected more cooling. As for your quoted figures over 120 years how about checking with all the SST measures and the accelerating rate of increase in recent decades along with ever faster SSL increase. The SST data is the classic one for deniers to grasp choosing high years as a start on pointing to a low one further on for a trend. Ice core data etc indicates that things are changing at a faster rate than at any time before and certainly before humans existed. If you go back far enough you find lots of different climate effects but the world and its orbit and partner star have all changed a lot over that time. We are now seeing rapid change, as evidenced by shifts in plant, animal and insect habitats, with moves toward the poles on decadal scales unexplained by anything other than warming. And that warming cannot be explained by natural causes. As for your assertion that there is no evidence for heat retention and CO2, sorry, you are just wrong. This scale of “debate” is insufficient to even bother to go there, just go and check the published science. This is one of those facts that is now not even commented on by mainstream science, it just is fact, like gravity and evolution (does that last one get you going?). As for your last point you have clearly fallen for the rubbish from the fossil fuel and ICE (internal combustion engine) industry fearing for their future. It will not send us broke. The economics of alternative power, electric vehicles etc is unstoppable even with the antics of Trump and Abbott. Get on board and have a nice history with your descendants please. Meantime go and check the BOM site, the Australian Academy of Science, etc etc. Gee it must be be the best organised conspiracy ever dreamed up. Ah yes, dreamed up – it is no conspiracy, it is science. Not getting into ad hominem attack but check the academic veracity of the vast majority of the science denying ‘scientists’, most of whom are not regarded as reputable climate scientists. they have varied and usually irrelevant areas of expertise. And the IPA, the Homeland Institute etc have all been exposed regarding their funding and purpose. Case closed. If you won’t look at the evidence I can’t convince you so argument over in a false equivalence stale mate, good bye. Just as I suspected, stu, you have no evidence whatsoever. But that doesn’t stop you from claiming you know all about the “heat retention” of ACO2. When of course it is based on opinion, based on positive feedbacks that cannot be measured. Only assumed in cli-sci GCMs. But don’t be shy. If you have any evidence in any of those places you don’t want to go, please feel free to provide it. I might add you will be the first that ever did. The “definite trend upwards” is the 0.6c +/- 0.2c over the last 120 years as reported by the IPCC and no one is denying that figure. That figure is accepted by both sides of the debate. Well, the rational ones anyway. So please stop ranting about “deniers” who do not deny any established climate science at all. And that small warming is well within the bounds of Nat Var. And you cannot prove otherwise. As to sea level rise, if you are aware of all the old sea walls that were built to the AHD100 datum [existing king tide level] before you were born, you will find that todays king tides are actually lower than they were over 70 years ago. Until tide gauges are all fitted with GPS chips for several years at least, and then a full audit is carried out, we won’t know what they are really telling us. The accuracy of Jason series altimetry is limited to +/- 3.4 centimetres so that method is a joke and cannot be taken seriously. What it boils down to with SLs, is essentially, king tides are no higher than they were 70 years ago and our beaches are wider and healthier than they have possibly ever been. That simple evidence is staring you in the face. And that evidence tells us that there is not much net land ice melt either. Particularly when -98c was recorded recently in the Antarctic. And by the way, ice core data distinctly shows that warming occurred at least 10 times faster at the start of the Holocene than it is at present. With virtually no human emissions whatsoever. And as for your other messenger-shooting rather than dealing with what is actually said, that is also just more evidence-free waffle. So stu, as John Williamson said, “heaven’s all around you if you’re lookin’, but how can you see it if you cry”. But you should stick around, stuey. You’ve still got lots to learn. And who knows, anything’s possible. This 2016 study seems to further confuse their CAGW claims. Has the Earths coastal land area increased over the last 30 years or not? Very confusing. Seems to be a lot of green dots over OZ. For people who have been involved with sea front infrastructure over a long period, as I have, and of course these Dutchies, where prevention of flooding by the ocean is a way of life, being aware of what the ocean is factually doing is part of your everyday existence. So, when CAGW “science” preaches the doom of fake SLR when your lyin’ eyes are telling you that, if anything, the reverse is actually happening, it makes any rational person extremely suspicious of their whole cli-sci bundle of joy. I also sail coastlines and estuarine areas a fair bit and the observable build-up of land and beaches in these areas over my lifetime is considerable. Imagine what the build-up of fertile estuarine land must actually be in such areas as the Ganges-Brahmaputra delta where the “science” keeps telling us it is all going to disappear? Of course, the doom scenario is purely based on groupthink projections, not measurements. So now I have proof that this site is moderated to only reflect the views of the owner. My earlier post has been blocked because it was critical. Oh well never mind, it just confirms my view of DA’s bias. Correction, apologies, that post has now appeared. Here is the Dutch Deltare Aqua Monitor when they launched their Nature study in 2016. The monitor is freely available for anyone to use to compare land and water changes around the world in real time. Interesting fine detail anywhere in the world and increase in coastal land is amazing find. But still early days. So which denialist website did you copy this from? Have you read the actual paper? Are you suggesting that the Kimberly region drainage basin of Australia has gained over 1,500 sq. km of new water [blue], and the central Australian drainage basin has gained over 2,000 sq km of new land [green] ?????? I suspect that once land reclaimation and dam building has been accounted for, their conclusion “… the world has acquired 115,000 km2 of water and 173,000 km2 of land in the last thirty years.” may be mostly an artefact in Landsat data, that echos the increased drying of land as the globe warms as water vapour increases in the atmosphere. If you could just convert water to land like this, housing affordability would no longer be a problem. Maybe you should invest in Lake George Real Estate. Poor ol’ blith just can’t get his head around the fact that the less-than-1c-of-warming since the end of the LIA which just happened to coincide with the industrial revolution is about half the rate of natural climate variability per century for the last 80 centuries. Your pet theory could even have some bearing on that small amount of warming, blith, but as it is logarithmic and not linear, it would only be small. In the meantime, to help with your enuresis, don’t forget to check those actual sea levels. They’re still out there waiting for you. I see Chris is still here, still condemning “cherry picked” data, which seem to be data that do not support his preferred CAGW narrative. Strangely, no mention of “homogenisation” of data by some quarters, I guess that is different to cherry picking. Give it a break, mate! It is time you took charge of this runaway train you have created and moderate some of the way out stuff here. Your mate Drongo for one, seems to have lost the plot. I always, years ago, gave you credit for more brains than seem to be operating now. As a balancing item consider this change of attitude and direction which could prove very symbolic. Here is a quote regarding a change of approach by a notoriously conservative organisation which I might add is very overdue and very refreshing. Fiona Simson, president of NFF. Quote from the Guardian. “Out in the bush, far from the ritualised political jousting in Canberra, attitudes are changing. Regional Australia has turned the corner when it comes to acknowledging the reality of climate change, says the woman now charged with safeguarding the interests of farmers in Canberra. One of the many advantages of Barnaby going off to breed with his staffer is that he’s no longer Agriculture Minister. They’ve replaced him with someone who has a clue…..
Not to mention Barnaby’s appalling inaction on the high numbers of live sheep exports and “mismanagement” of the Murray Darling irrigation water buy-back scheme. We have a lot to thank Campion for. Davie, your green/left MD proposals are against the laws of nature. Also, live sheep [and cattle] exports by sea are potentially less dangerous than transport by road. It is the people that do the shipping that need auditing to make sure they do the right thing. It is not hard to provide good food, water and habitat on board ship. You could do with a sea voyage yourself. How is allowing the water in the Murray Darling to flow down hill against the Laws of Nature? That’s right, jimb. It’s amazing how people who are completely ignorant of the past can be so much more conveniently manipulated than those who have lived through and/or are aware of, those past climate experiences. It’s just like today’s millionaires paying tens of millions for ocean front homes on the Gold Coast that were being washed out to sea 50 years ago. Homes that nobody was interested in until recently except at bargain prices. When you foolish true believers deny the past you provide a great source of income for people like me. So, what you are saying, stu: When you get a request for evidence that you can’t cope with, it’s not the science that counts, it’s the belief? And when rational people don’t go along with your evidence-free belief they have to be put down? BTW, Fiona Simpson wasn’t around in 1791 when thousands of birds were dropping dead in flight from “freak weather” in her area. But what you are talking about here has nothing to do with the science of CC. I have lived and worked in Sturt’s Stony Desert in 50c temps during the ’50s, measured on verandahs that were built to be as cool as a Coolgardie safe. The old records of similar and greater heat prior to 1910 have all been wiped by the true believers. The BoM deleted a Stevenson Screen measured 125f at Bourke PO in 1909 and other measurements of up to 128f have also been deleted. Selecting a cool 1910 as a starting point for “data” has been a great win for you warmists. When are you CAGW groupthinkers ever going to face the fact that until we reach global warming that is in excess of Nat Var and warmer than we have had in the not too distant past this is only your belief that is talking. So Stu and Jimbo can you please tell us what you would do about your delusional nonsense and what difference it would make? I’ve supplied the evidence many times from the EIA and the IEA. but you people seem to prefer to live in your fantasy world. Devices such as: “delusional nonesense” and “fantasy world” are the outpourings of denialists. Throwing stuff from EIA and IEA totally misunderstands the issue. It is a denialist distraction. Let’s hear YOUR solution again then, blith. Somehow I must have missed it to date. Here’s more idiocy from so called educated people. Absurd SBS Ad telling people to turn off their heating to help reduce our Co2 emissions. Who believes these barking mad fools? Accusing others, better informed than yourself, of “idiocy” and describing them as “barking mad fools” means you are a denialist. You are only trying to attract attention. Ah, so that’s it, blith? Well I think we’ll leave Chris in his make believe world where he can ignore evidence and just make up stuff along the way. Deniers make false accusations of “ignore evidence” and “make up stuff”. That’s because blitherers and bed-wetters have no evidence for their CAGW theory other than made up GCMs. Nothing false about that, blith. Damien Cave, the NY Times Australia bureau chief, writes yet another heart-rending story with great personal touches about how the Solomon Islands are being “swallowed by the sea”. This is just a story of a sand bank that has simply washed away yet with a dose of fakery added they claim excessive SLR when in fact sea levels, if anything, have dropped. Sea levels in this part of the world vary depending on the strength of the trade winds.